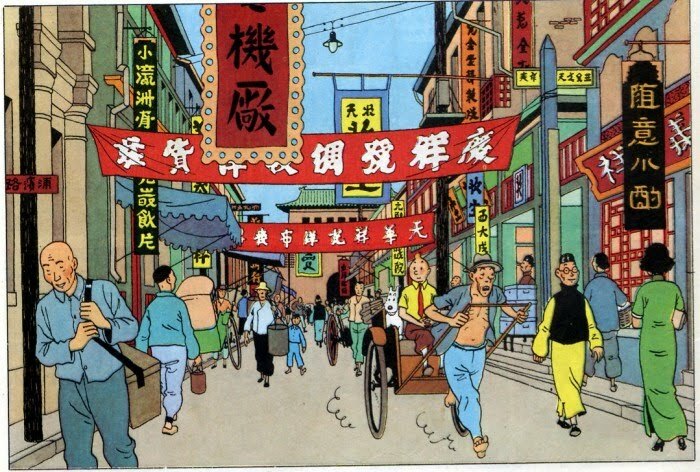 As a scholar who is always interested in popular culture, and especially the ways in which it can be interpreted and reinterpreted across cultural boundaries, I found the idea of seeing The Adventures of Tintin to be an intriguing prospect. On the one hand, intellectually it was interesting to see how an internationally popular character would be interpreted for American audiences, and on the other, given the pedigree of its filmmakers, I assumed it would at least be a fun watch. First illustrated by the Belgian artist Hergé over seventy years ago, the world-travelling kid reporter Tintin has long been a popular icon to many European, and especially French-speaking, countries, but otherwise has never really crossed the Atlantic’s cultural divide, standing as largely an unknown quantity to American audiences. And to be fair, outside of my own reading on the history of comic books and comic art, the character represents something of an unknown quantity to me as well. However, now that I have seen director Steven Spielberg and producer Peter Jackson’s long in development film version, the appeal of the character remains unknown to me, and I’m assuming it will to others. Whether it’s truly a faithful version of the character and his universe, I’m not one to say, but what I can say, is that as a film, and perhaps more accurately, as a film going experience, The Adventures of Tintin just isn’t very good. 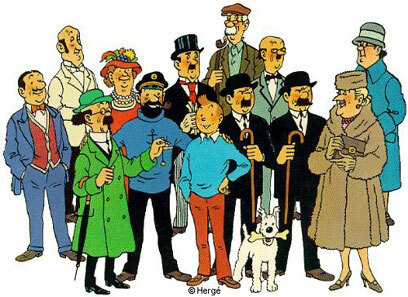 First illustrated by Hergé in 1929, Tintin and his assortment of characters have been popular children's reading for decades in many European countries. The story of course, revolves around the title character, Tintin (Jaimie Bell), who before we even get a chance to know either he or his trusted and resourceful white-haired terrier Snowy, thrusts himself into a mystery involving three model ships, all of which contain a clue to the location of a lost ship called the Unicorn. Unfortunately for Tintin and Snowy, danger is afoot, as also pursuing the prize is the evil Professor Sakharine (Daniel Craig) and his small army of henchmen (between this guy and Professor Moriarty, professors must get paid much better in Europe then they do here to afford all these mercenary armies). 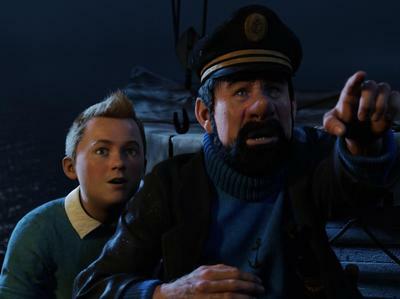 While pursuing Sakharine, Tintin rescues and recruits the semi-alcoholic and bumbling sea captain Archibald Haddock (Andy Serkis), descendent of the Unicorn’s original heroic captain, to help track down the lost ship’s forgotten secret. Their adventure takes them through no end (and I mean that quite literally) of danger, action, and mystery as they try to reach the Unicorn’s cargo before Sakharine. 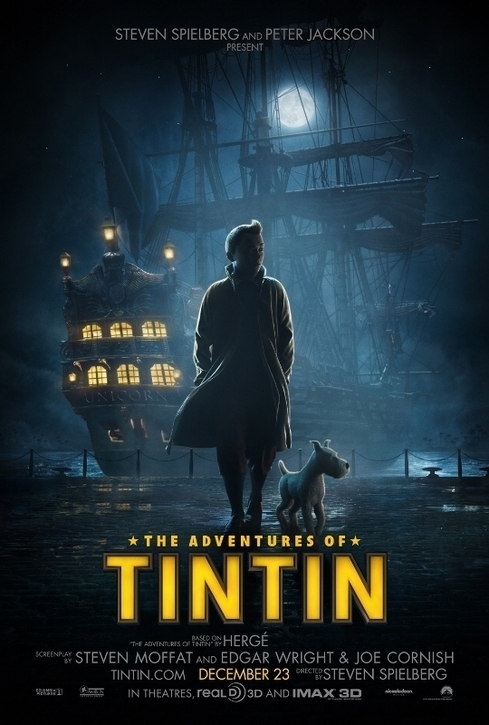 Tintin (Jamie Bell) and his somewhat insufferable ally, Captain Archibald Haddock (Andy Serkis) team up to hunt down the secret of the lost ship, the Unicorn. 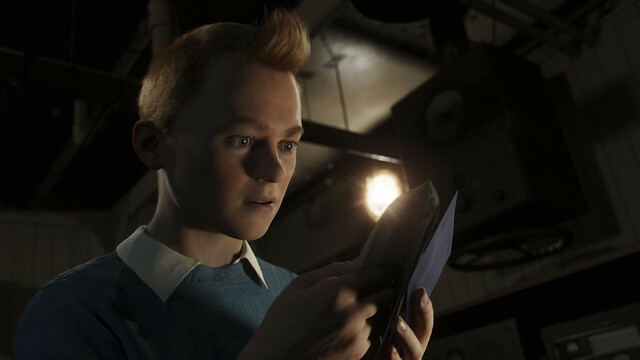 Animated in three-dimensional motion capture by New Zealand’s Weta Digital, which famously created the effects for The Lord of the Rings films, Tintin perhaps succeeds on some kind of technical level. Of course, having seen a great deal of Hergé’s famed artwork, the deceptively simplistic style dubbed “ligne claire,” for “clear line,” the film’s hyper-realized harsh lighting, deep shadows, and explicit detailing is almost the artistic antithesis of the original comics’ elegant, colorful artwork. And though the film may boast undeniably high quality animation, the problem, as is with most films made with this approach, is that you’ll stop recognizing that fact after about five minutes of being subjected to it. There’s just something about the full-motion capture style that just doesn’t work without it being blended into a live action story, and I’m honestly not really sure exactly why that is. Certainly Pixar, Dreamworks, Fox, Disney, and others have had great success creating films that are entirely 3D animated, and who featured lovable, relatable characters (well, at least in Pixar’s case). But full motion capture animation just seems to be perpetually caught in this strange limbo between the realistic and the inauthentic that somehow leaves me, and I think I speak for many people, emotionally isolated and dissociated with what we’re seeing. It might be that it’s too realistic for us to treat it, on some cognitive level, the same way as animation, where we willingly except the slightly modified rules of reality that accompany something that we accept as a cartoon. Or perhaps it still appears so animated that we just can’t interpret it as realistic enough to hold any true physical gravitas. The truth is that it might be some combination of both, but at the end of the day, the result is the same here as it has been for films such as The Polar Express and Beowulf: an ineffective, utterly awkward-looking film. Hergé's "ligne claire" style in the original Tintin comics seems ill-served by 3D motion capture animation, which certainly has its own problems. Even trying to ignore the limitations of the animation style, the film that remains just doesn’t really work. It’s surprising, since both Spielberg and Jackson are so typically adroit at presenting thrilling adventure stories, and the writers, including Stephen Moffat, Joe Cornish, and Edgar Wright, are no slouches with action plotting and humorous dialogue, but there’s very little that’s compelling here once it sstory gets moving, which it does almost instantaneously. What actually kind of shocked and frustrated me was that the filmmakers really did nothing to compensate for my lack of knowledge about Tintin, if indeed there indeed is anything to really know. The excellent opening credit sequence gives us a fun little walkthrough of a prototypical Tintin adventure story, but once the film gets rolling we’re either expected to know everything about this boy reporter, or just accept the fact he’s the hero and go along for the ride. And that’s a huge problem, because Tintin, as a character, just has nothing going on. 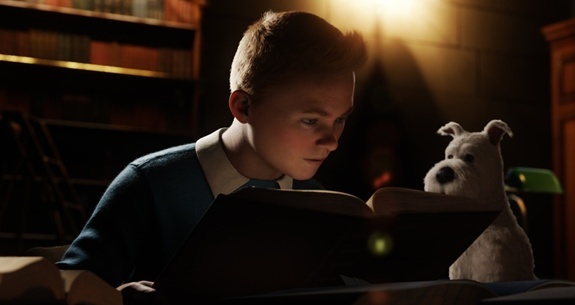 If you're someone who hasn't read the Tintin stories before now, the film does a surprisingly poor job of introducing you to the character and his world. 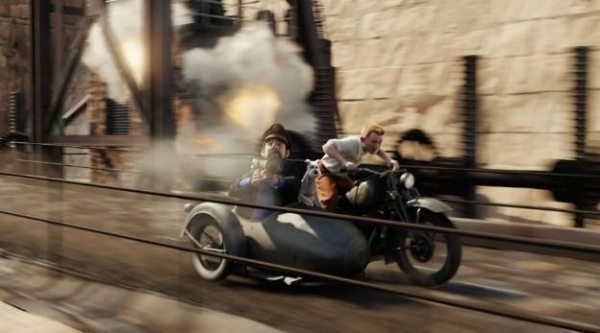 Of course, this film will and has invited comparisons to Raiders of the Lost Ark, and as the story goes, Spielberg first discovered Tintin when may European critics compared his famed film to Hergé’s stories. But the thing with Raiders is that it had Indiana Jones, who besides being an iconic character was also an interestingly flawed one. I had a screenwriting instructor who would always repeat, over and over, “Remember, Indiana Jones was afraid of snakes.” He did this to remind us writers that even the most heroic characters needed something to make them human, to impede them from being idealized, invincible, perfect beings that never change, never grow, and never develop. Watching Tintin, he has absolutely none of those humanizing traits. Again, I’m not sure how he was portrayed in the original stories, but here he almost always had the answers, always knew what to do, and was always able to either dodge bullets or throw punches at the right time whenever he needed to get out of danger. He also has really no motivation whatsoever, and no personal stake in the story that he’s involved in. The film does nothing to tell us about Tintin, or why he takes it upon himself to insert himself into this globe-trotting quest. Who is he? Why is he a reporter? Who does he work for? How old is he? If he is a kid, why is he living on his own? Does he have a girlfriend? Does he want a girlfriend? What the hell kind of name is “Tintin?” What does he care about a lost ship? There are a dozen similar questions that pop up, and the film really doesn’t answer any of them. All told, Tintin may be one of the most boring protagonists I’ve seen in years, because for all the traveling around the world he does in this film, he doesn’t have anything resembling a true journey. He’s the same character at the beginning of the film that he is at the end, and the only thing he engendered in me was a feeling of strict ambivalence. The character that most of the change does seem reserved for is Haddock, which is itself a problem because as supporting acts go, he’s insufferable; he reminded me, frankly, of Mater from Cars, if Mater was British and drunk, and that the usually nuanced Serkis completely overplays the part only makes it worse. Now, given the fact Tintin is a very old-fashioned character, perhaps the way he’s presented in the movie is just how he’s always been. Certainly, Hergé had long been criticized for sometimes working more in types and stereotypes than in characters (though he’s hardly the only person from that era deserving of that charge). But film and adventure stories have, to their credit, gotten more sophisticated, and maintaining that older approach nowadays is just not going to cut it anymore. Raiders of the Lost Ark was undeniably a throwback to the old serials of the thirties and forties, but its hero was as modern in his appeal as his adventures were old-fashioned. It wasn’t entirely because Indiana Jones was afraid of snakes, but it certainly helped. 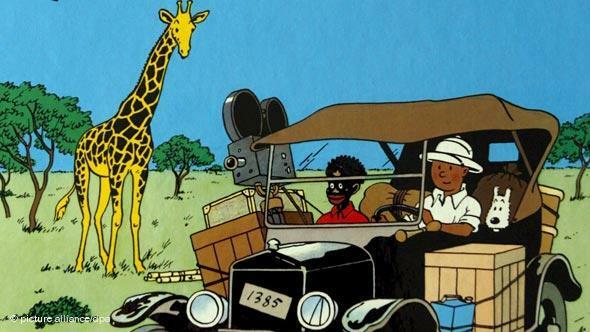 Hergé was and is often criticized for the abundant stereotyping in many of his original Tintin stories, as can be seen here in "Tintin in the Congo," a book that, in many places, is understandably banned. What also doesn’t help The Adventures of Tintin any is the simple fact that it’s irritatingly excessive. There’s hardly ever a point once its story gets going that Spielberg’s “camera” stops moving, or that his intensely kinetic plot provides even a momentary breather from the endless chaos playing out on screen. The film feels like the proverbial “roller coaster ride,” if one were trapped on the same roller coaster on an endless loop for almost two hours (though it feels much, much longer). There’s almost nothing but non-stop movement here, in the form of explosions, fighting, gun fighting, sword fighting, car chasing, bird chasing, dog chasing, and so on, so much so that it all left me numb to the point of boredom. It’s a shame in many respects, too, because taken as individual set pieces much of the action is creatively conceived and often quite inspired, especially in 3D. But all together it’s just much too much, and so much so that by the time two major characters at film’s end start dueling with giant construction cranes, watching it feels more like a chore than a cause for excitement. "The Adventures 'of Tintin" offers no end of action. As in, it feels like it goes on forever. In the end, I can’t help but wonder whom exactly this film was made for. Of course, the semi-cynical answer would be “Europeans,” but honestly, The Adventures of Tintin proves to be far too violent for kids and families, too childish for teens and young men, too unsentimental for women of all ages, and too obscure for everyone else. Again, I can’t speak for those who are fans of Hergé’s original works; for them this might be a wondrous fan experience, though I wouldn’t count on it. If anything, this seemed entirely like two filmmakers getting a little too caught up in their own excesses and their own fandom, making a movie for themselves, not for an audience. That’s fine if you’re crafting a piece of high art, but when you’re ostensibly advertising something as mass entertainment, there should be an obligation toward making something not only of quality but of proper tone and geared towards audience satisfaction. In the end, The Adventures of Tintin feels self-indulgent and for the most part, undeniably unentertaining. And definitely not a ride worth taking. Posted on January 3, 2012, in The Antiscribe Appraisals (Reviews). Bookmark the permalink. Leave a comment.